Welcome to my Build a Line Challenge Blog, Once Upon a Line! I'm Lynda O'Mara of LOmara Creative Designs in Denver, Colorado (I'm actually in Lakewood, which is a suburb of Denver, see the photo above taken by the wonderful, talented Cathy Harris who lives near me). This blog entry is part of a series of three blog hops (yes, that's a new concept to me) that I am participating in with almost 60 other jewelry designers from around the world. These blog hops are just part of the Build a Line Challenge that is the brainchild of Brenda Sue Lansdowne of B'Sue Boutiques. Over the next three months, those of us participating in the Challenge will be working on creating our own personal line of jewelry suited to our market's taste, style, and budget. At the end of the Challenge, each of the participants will reveal a minimum of five original pieces that will be our "new jewelry line". In my previous blog post, "The Road So Far", I talked about my journey from childhood until now in the world of handmade items. I've always loved creating things, first for my family and friends and later for my customers. For the past 8 or 9 years, I've focused on jewelry design since I love the possibilities of putting beads, brass stampings, and different techniques together to create fun pieces of jewelry that people can wear and enjoy. With this incarnation, I started with stringing necklaces, bracelets and earrings. At first, I bought beads at craft stores, like Michaels, and then I discovered my first bead show! OMG! It was like Dorothy reaching the Emerald City with all of the colors and excitement! I kind of went out of my mind with all the booths of beautiful beads to choose from. It's a good thing I had my credit card with me! The variety of beads was so much more than I had ever seen and my mind was whirling with ideas of what to do with all of those beads and techniques! I took classes on various techniques since most bead shows offer classes at the show. 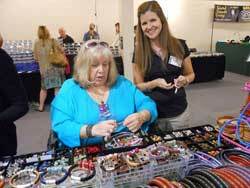 Here I am at a bead show during my leather bracelet stage! After a few years, at one of the bead shows, I found brass components that I could color to work with any design that I wanted, but the number of components was extremely limited. 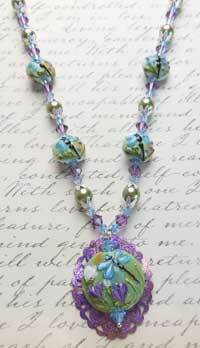 Enter B'Sue Boutiques which I found, not at a bead show, but on the web! Brenda Sue Lansdowne, the B'Sue of B'Sue Boutiques, has filmed over 100 instructional videos on her YouTube channel. It was the Emerald City all over again. After watching a few videos and checking out the B'Sue Boutiques website, new ideas and designs were flooding my mind and I couldn't wait to start creating new and different jewelry than I'd made before. And, I became a great customer of B'Sue as the lure of bead shows began to fade into the background. I still love bead shows, but there's so much available at B'Sue Boutiques, I can use my computer mouse instead of walking through the aisles of shows. And, I can even take classes online at the YouTube channel! My Theme! When Brass meets Glass! S o, now back to the Challenge. When I decided to take this Build a Line Challenge, I couldn't come up with a theme for my new line of jewelry. Up until now, I've mostly done one-of-a-kind pieces that were only minimally cohesive in their design. I know that people like my designs because whenever I show my jewelry either to friends or at a show, people buy it. But, having a cohesive line of jewelry that I'll be creating under the tuteladge of the wonderful Brenda Sue Lansdowne is something that really appealed to me. So, what would my theme be? Well, one morning during my morning meditation, my intention was to get guidance on what to do, and it came to me! I can combine my love of Grace Ma's lampwork beads and the wonderful brass stampings and techniques that I've learned from B'Sue Boutiques! That morning the name of my blog, Once Upon a Line, and my theme, When Brass meets Glass came to me and that is the direction I'm taking! 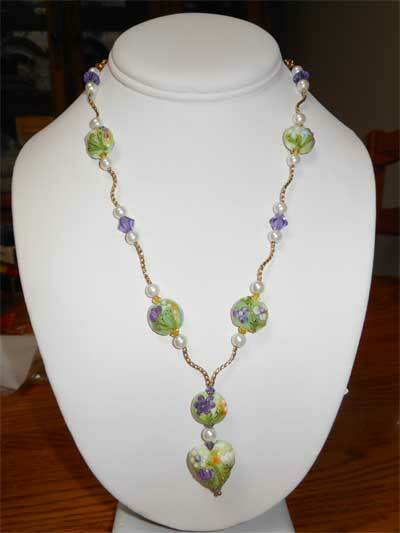 The photo to the right is the first piece I put together using colored filigree and glass lampwork beads. And on the left are some components of one of my Challenge pieces. How will it turn out? As we go through this Challenge journey, I'll be creating and showing more designs using both brass components from B'Sue Boutiques and lampwork beads. It's already been fun and I know I'm already a better jewelry designer. Accompanyin g us on this journey will be my assistant and Quality Control Manager, Ms. Tessa Kitty. She reminds me when it's time to stop working and feed, pet or play with her. 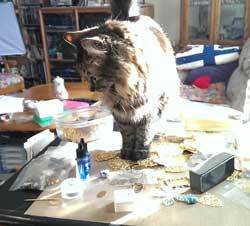 Here she is inspecting my very messy work area. Below is a list of the other jewelry artists and designers that are on this three month journey with Tessa and me. Whether you're in the challenge or are someone who found my blog, please visit the blogs below and feel free to leave comments if you like their story or their designs (or their assistants) for encouragement. We're all in this together and at the end, we will all be better designers and able to offer wonderful lines of jewelry to the world. Love your back story and your challenge design. It's been my experience brass and glass really like each other, so I'm excited to see where your line goes! What a great read, Lynda ♥ Your fabulous way with color creates pieces of quiet exuberance. Can't wait to see the unfolding of your line!! I enjoyed the story of how you got started. I had a similar experience at my first bead show. I had to start leaving my credit cards at home when I attended them, taking only enough cash as I was budgeting for shiny things. I love the name of your line and look forward to seeing how you put those components together. Great post, and I love the name of your line! So glad you joined us for this challenge, Lynda! You have wonderful and varied skills and I am just so glad to have you aboard! Great Blog and cannot wait to see your completed pieces! So happy to be in this journey together! Great idea and love the name! Can't wait to see how it turns out!! Brass meets glass sounds just beautiful. Hi Lynda! Love your theme, so original ! and I had a journey quite like yours when I found Gem Shows and then found Brenda Sue on the internet! Tessa should meet my Booda Boy! Best wishes! Sandie B.
I love your story and your designs. As a resident (well, I used to be) of Oz, merely a near neighbor now, I totally understand about the bead shows and the world of beads meeting brass. It's going to be wonderful seeing what you design. Love your theme. I agree gem shows are awesome but B'sue brass is even better. Love your blog! Looking forward to taking this journey together! Very creative, talented and imaginative and now a good writer too! Looking forward to following your journey and seeing the evolution of design. I'm so glad to find out I'm not the only one who struggled with an idea for a cohesive theme! I think your work is beautiful and can't wait to see your line as we progress. Such a rich and vibrant feel to your work. Love the brass and glass combo and I bet this new line of yours is going to rock! What a great blog, and I like the idea of when brass meets glass! I can't wait to see your progress! 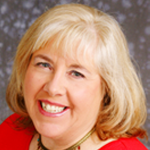 I love you back story Lynda and I love the direction your meditation took you!!! Great choice of materials and I love your first piece. Can't wait to see what you make next!!! Be Blessed! I can see I'm going to have to get some inks and others coloring agents to play with. I really love the look you've achieved. Lynda, your line is going to be lovely! Love your kitty, too! Love your blog and your story. I am very familiar with Grace Ma's stunning lampwork beads, too. Your theme is wonderful and I'm looking forward to seeing your creations. Looking forward to seeing your line! Lynda, a fellow Lakewood CO resident. Perhaps we can meet up for coffee sometime. Love the idea of "Brass and Glass" and looking forward to the completed line. Great read! Lampwork beads are beautiful, looking forward to seeing your line! Can't wait to see the finished line! I too have a hoard I mean collection of grace beads. Beautiful beginnings. Excited to see more. I started out just string too and I love beautiful an interesting beads as well. I love your concept for the challenge and look forward to seeing your creations, love your kitty also. happy creating. Another lampwork lover!! This is a wonderful combination and I love your catchy names!! I have a small collection of lampwork beads. 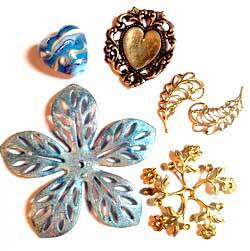 I can't wait to see how you design with brass and glass beads. OOh brass and glass- great theme- looking forward to seeing what you do ! I have a collection of lampwork beads that I just can't seem to part with. I love the inspiration for your line, and I think it will give me some inspiration as well. I am very delighted and intrigued to watch your line develop. Love the name of your blog too!